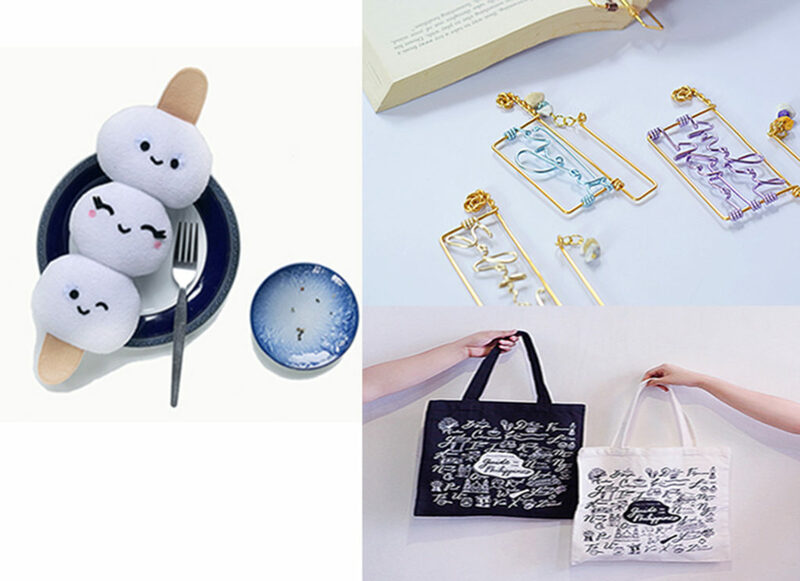 The first day focuses on merchandising on the web, “A Training on Digital Marketing” with resource persons from Google Singapore and Philippines. As a follow-through activity to this training, a Workshop Signing-up with Google My Business will allow entrepreneurs to own a website which will showcase their products and services. Participants attending this workshop are advised to bring their mobile devices. For the afternoon session, a lecture series will be conducted by Lazada Philippines, one of the country’s top online selling platform, beginning with a refresher course on the basics of Ecommerce 101. Another session, “The Future of Shopping Using Facebook to Increase Sales” will touch on how social media accounts are used in marketing. 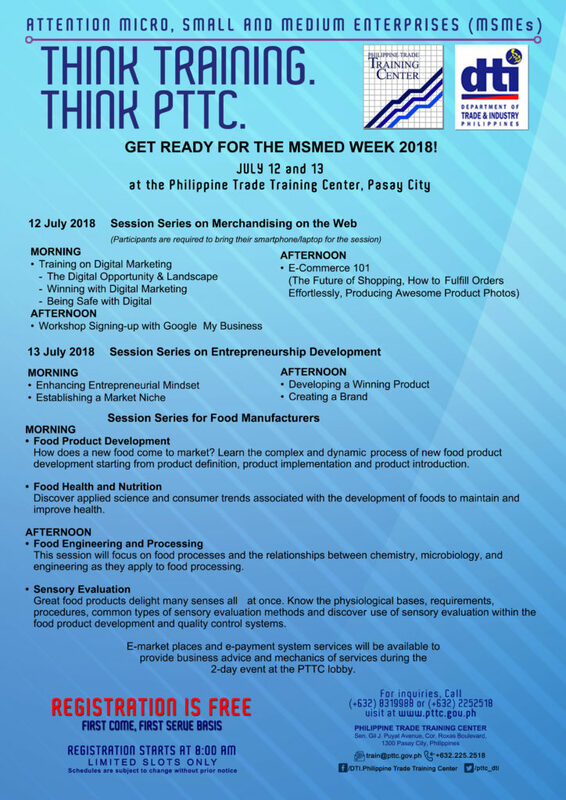 The second day of the seminar focuses on session series for food manufacturers and entrepreneurship development – “Enhancing Entrepreneurial Mindset”, “Establishing a Market Niche”, “Developing a Winning Product”, “Creating a Brand”, Food Product Development”, Food Engineering and Processing, to name a few. Kindly refer to the schedule of the seminars below. For more information, you may contact telephone numbers 831-9988 or email train@pttc.gov.ph. You may also follow our facebook page, DTI.Philippine Trade Training Center. Registration is on the day of the seminar and on a first-come first-serve basis so make sure that you come early. Following the successful kick-off in Vancouver, the Philippine Department of Trade and Industry (DTI) will bring the “Flavours of the Philippines” In-Store Promotion to T&T Supermarket in Pacific Place Mall, Calgary, Alberta from 8 June to 10 June 2018. 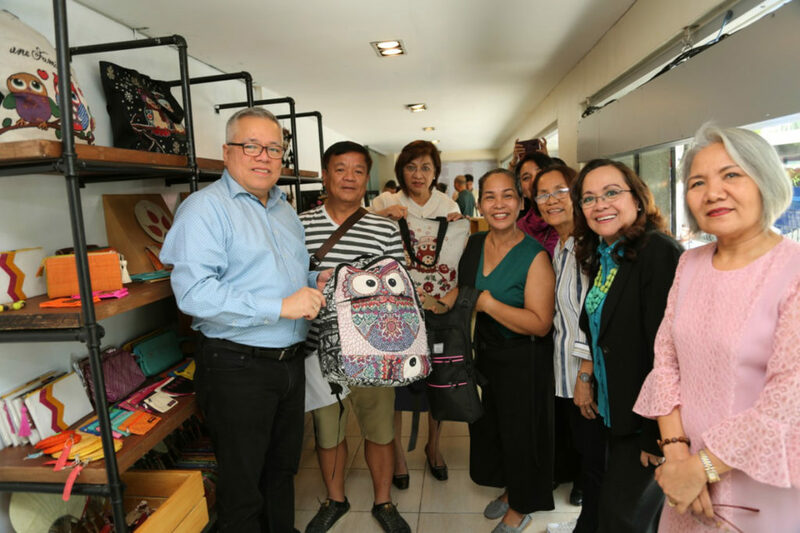 “It is very timely to showcase the quality of Filipino brands to celebrate our Filipino heritage in time with Independence Day,” said DTI Senior Trade Commissioner Maria Roseni M. Alvero. 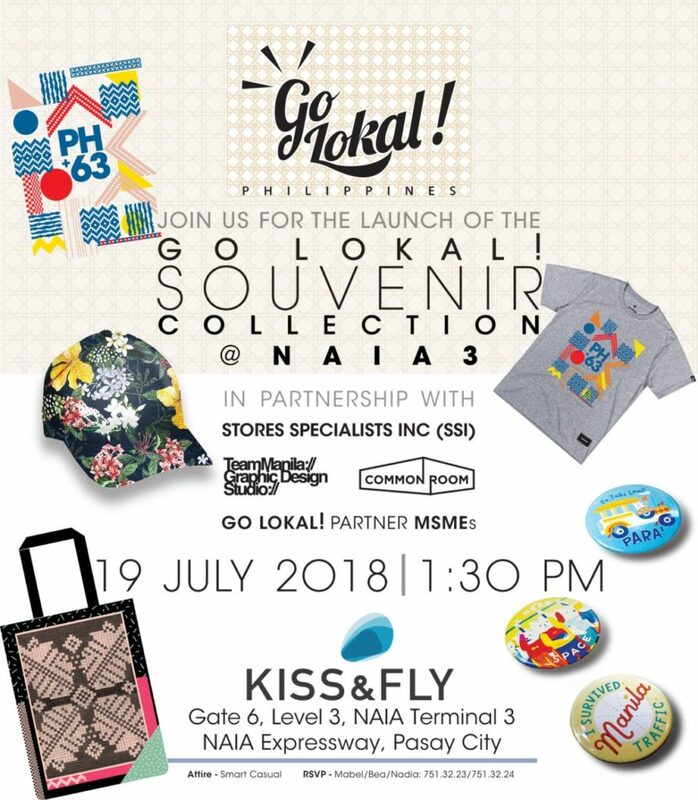 On 8 June 2018, T&T Supermarket will start showcasing Filipino food at the dedicated stalls for Flavours of the Philippines through pallet displays and food tasting stations. It will be followed by a ceremony on 9 June 2018 with the Filipino-Canadian community where attendees will be treated to lively music and a vibrant display of Filipino talent with cultural performances by the Philippine Cultural Center Foundation. Hon. Consul General Gilberto Asuque is expected to welcome the Filipino-Canadian and mainstream community in Calgary during the event. The event, considered to be a centerpiece trade and cultural program with the Philippine Consulate General in Calgary and the Department of Tourism in San Francisco, aims to reconnect Filipino-Canadians with the motherland in time for the celebration of the anniversary of Philippine Independence. 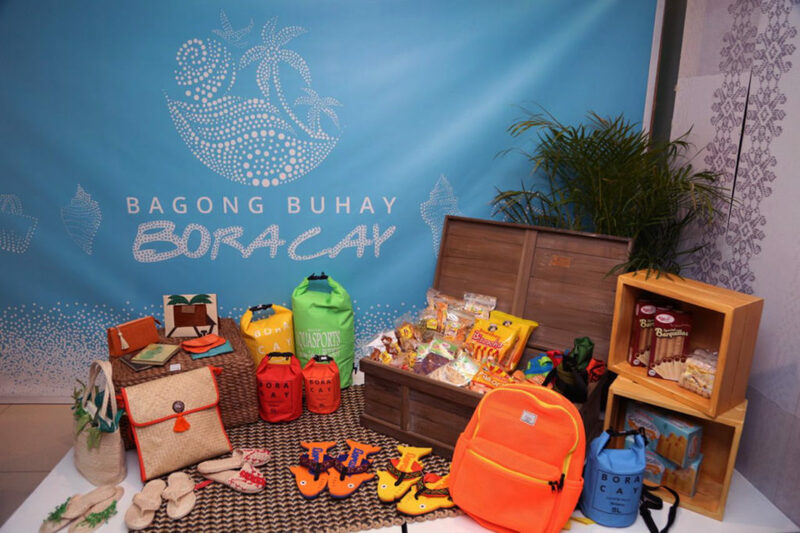 It also aims to increase the consumer awareness and appreciation for Philippine food products among Canadian consumers. The weekend-long festivities will also include cooking demonstrations of delicious Filipino dishes and big discounts on popular Filipino products. 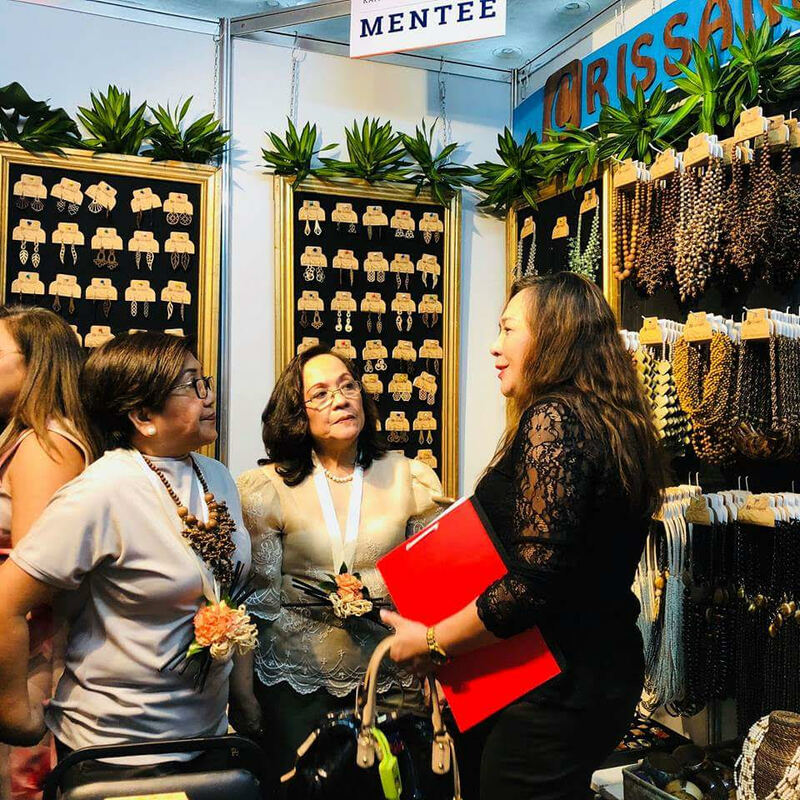 “We hope that this event will contribute in raising the popularity of Philippine cuisine along the levels enjoyed by other internationally accepted Asian cuisine, ultimately towards increasing the level of Filipino food exports into Canada,” Alvero added. 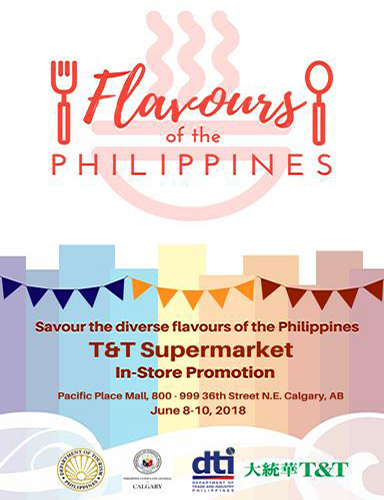 “Flavours of the Philippines” at T&T Supermarket is the second of a series of In-Store Promotion events in Canada spearheaded by DTI this year, following an In-Store Promotion at the PriceSmart Supermarket in Richmond, British Columbia. In 2016, Canada was the 16th export market (out of 213) of Philippine merchandise goods. Processed food including processed fruits and vegetables and processed marine and ethnic foods are among the top commodities for export promotion in the said market.